“You have to have fun with hair. It’s a great accessory. Play with it.” – Serge Normant. This statement couldn’t be truer. With festivals like Afropunk and Coachella for inspiration, why not join in the fun? Get an easy and exciting new look with Inecto Colours and Inecto Plus. Natural curls are the right choice for any woman with a sophisticated taste. Make this stylish look a perfect fit for a fun festival or a fancy ball with the right colour. Add a dash of extra class to your curls, without spending a lot of time or money, with Inecto’s Black Velvet from the Inecto Plus range. Give this elegant hairdo some extra shimmer with a light spritz of oil sheen spray. Tip: Wear bright colours and gold accessories to complement your Black Velvet locks. Brighten up your day and your look with Inecto Colours’ Caramel Blonde. This sweet hairstyle captures the fun spirit and style of the best festivals of the year. Wear this hairstyle with a black top and jeans to look stylish yet laid back. With the right makeup and accessories, you can make this colour really pop. Burgundy is a colour for a woman in search of a sophisticated shade of red. Let everyone know that you’re a woman with social grace with Inecto Plus’ Burgundy Bliss. This colour is the perfect fit for all of your favourite festivals. From Afropunk to the Met Gala, this colour will cause a stir wherever you go. To get the most from your burgundy bliss, rock it with colours such as teal, mustard yellow, white and black. If any brown can turn a hairdo into a ritzy hairstyle, it’s Inecto Plus' Hazelnut Brown. This light brown colour will illuminate your skin and make your natural beauty shine even brighter. It’s the perfect colour for the red carpet or even just a get together with friends. Light yellow, navy blue, bold pinks, red and neutral colours will compliment your new luxurious locks. So give it a go. It could be the colour you’ve been looking for. This brown is easy on the eyes and hard to beat. Purple is royalty. Purple is magic. But more importantly, purple is passion. Just add Inecto Colours Passion Plum to any hairstyle for a fun and vibrant new look. It’s the perfect colour to show the world that you’re fun, mysterious and passionate. 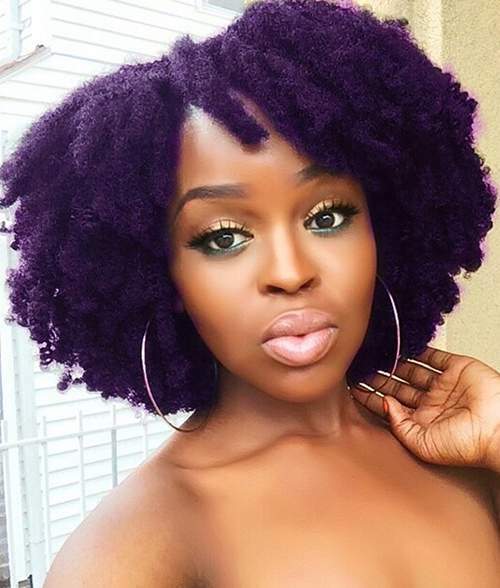 Pair your new purple locks with yellow, dark greens, pink or red. Vibrant, new and fantastically you. Nothing says cool and confident quite like blue. It’s the colour of intelligence, empathy and serenity. Let this versatile colour say so much about you and will give your style a complete refresh. Use Inecto Colours Blue Black for a great midnight blue do. The beautiful thing about Blue Black hair is that it works so well with every colour. Pair it with red, grey, white and lighter shades of blue to really stand out. Once you’ve gone Blue Black you’ll never go back. With so many styles and colours to choose from, your hair is a fun accessory to play with. Find the perfect look to wear to your favourite festivals with a wide variety of colours from the Inecto Colours and Inecto Plus ranges. Share your refreshed look with us on Facebook or Instagram. Don’t forget to stay in touch for more ways to get the most out of your hair.